In this era of digital world, IT industry is undergoing tremendous transformation to provide client services at faster pace, competitive price with no compromise on quality. To live to the expectations of this journey, IT professionals are coming up with innovative methods and approaches in software delivery. As the subject (IT Services) is very vast, we are limiting our discussion to Rollout models and approaches for Cloud solutions. With the advent of cloud based products, the infra, platform, software is available real time and the enterprise set up can be done in days’ time with minimal initial investment. The same activity earlier used to demand high initial investment with longer lead time to set up. Business is expecting similar agility & speed in solution deployment to markets across geographies. The challenging factors of business readiness, adoption, process harmonization etc. still remain the same. In the subsequent sections, we will talk about the ways and approaches to sail through the challenges and deliver the roll outs programs successfully with speed and agility. Below are some key concepts that needs to be considered for Cloud based global rollout programs. Traditionally roll out approach involved investing time and money in process harmonization across business units and developing a global template solution. This template solution was then deployed across regions and business units in a phased manner. The solution deployment involved rolling out of the already build global template with legal & statutory requirements specific to the region. The traditional approach of building global template & subsequently rolling out to markets was well suited for On Premise implementations. With the advent of cloud products, the minimum viable solution can be set up easily & can be made available to markets in quick time with very minimum configurations. This has provided an opportunity to explore and evaluate other approaches along with traditional approach. In this section, we are presenting our thoughts on Minimum Viable Product( approach) and how this approach can be used to enhance the solution and finally deliver complete product. Note: The selection of the approach differs from client to client and solely depends on Client specific requirements and needs. 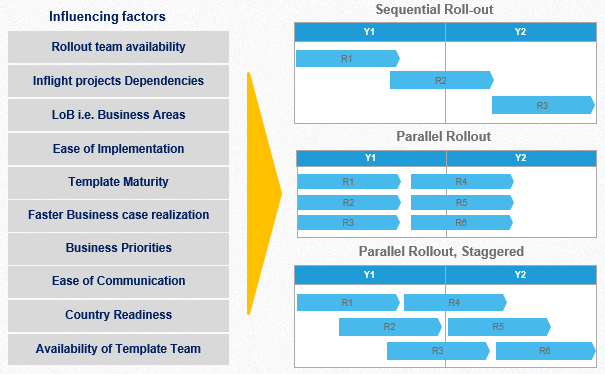 Right selection of rollout model is very important for a successful deployment of the solution. In this section, we will provide details around various rollout models that can be considered for iterative template build. Right clustering strategy is needed to optimize the efforts in gathering requirements, building and deploying the solution across markets. 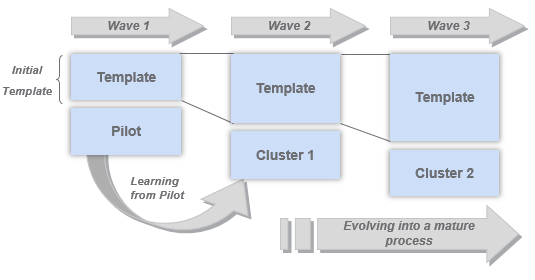 The clustering strategy for roll out can be implemented using joint session with the customer validating the clustering and sequencing logic in order to baseline the same for the program. There are several influential factors like facts, constraints and business insights that determine the clustering strategy for roll out programs. 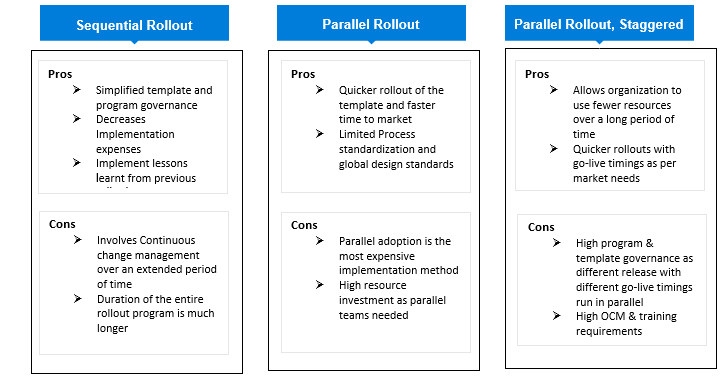 In this article, we discussed about some of the key concepts that are essential for picking up the right template approach, roll out model & clustering strategy for global template cloud solution deployments. In next blog, we will further discuss on the custom developments approach, risks, challenges and leanings from global roll outs.